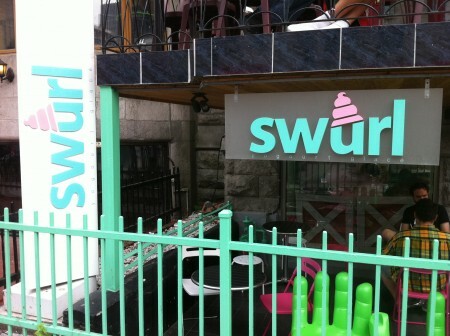 swUrl is a frozen yogurt shop with a lot of character located at 1464 Crescent street. We were invited to attend a tasting of their Bacon flavored frozen yogurt and we couldn’t pass it up. Before getting in we were greeted by two brand ambassadors decked out in bacon themed attire and we were handed a pass to unlimited frozen yogurt. The first thing to try was of course the bacon flavored yogurt. Although I was skeptical at first, I learned that there isn’t actually real bacon in the yogurt, so I gave it a try. It was actually pretty good and even better paired with hickory sticks as the staff suggested. So I thought that I was going to walk out of there without tasting real bacon strips with frozen yogurt. I thought wrong. The next thing I sampled was a frozen yogurt sandwich topped with real bacon strips between two cookies. The cookie was the dominant flavor, but you can definitely taste and feel the bacon mixed in with the frozen yogurt. It actually did work. In addition to bacon swUrl offers classic flavors like vanilla along with seasonal flavors. I’m told that the favorites seem to be cupcake flavor and mango. Tags: Bacon, Frozen Yogurt, Mango, Montreal.